Home / News / Politics / Atty Chong slams Ressa: How much you earned to write fake news? Atty Chong slams Ressa: How much you earned to write fake news? After a report about his participation in the recent Senate hearing has been posted online, lawyer and former Biliran Glen Chong lambasted Rappler's Maria Ressa, calling her report "fake news". Ressa shared the Rappler article "Letters show 2016 poll fraud accuser represented Marcos". 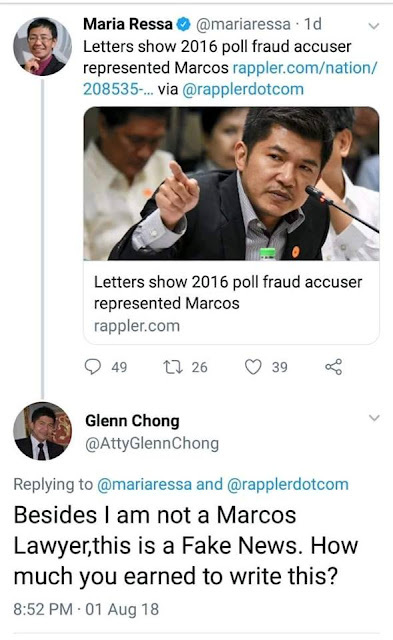 The article tells how Chong alleged that there was fraud in the 2016 elections, and after denied the accusations that he once represented former Senator Ferdinand Marcos Jr.
"I am not a Marcos Lawyer, this is Fake News. How much you earned to write this?" Chong tweeted as a reply to Ressa who shared the article in the same platform. This is subsequent to how Senate Minority Leader Franklin Drilon raised the issue on Tuesday, July 31, during a Senate hearing on the alleged poll fraud in 2016, where Chong is one of the resource persons alleging the anomaly. Rappler reported that Drilon said Chong was among the representatives authorized by the Marcos camp to attend the Decryption of Secure Digital Cards, the Comelec briefing and the stripping of the Unused CCS kits and back-up of SD cards in 2017. According to the article, the letters of Marcos’ lawyer, however, did not say that they were “nominating” Chong. Instead, they were already informing Comelec that they will be “sending” Chong as among the “regular and alternate representatives of protestant Ferdinand “Bongbong” R. Marcos Jr” in the said events. "The letter is from Marcos lawyer Atty. Garcia nominating Atty. Glenn Chong. This is not enough proof that Atty. Chong was in fact the lawyer of BBM. Ressa and Rappler hold on to hearsay on this one and claim it for a fact. 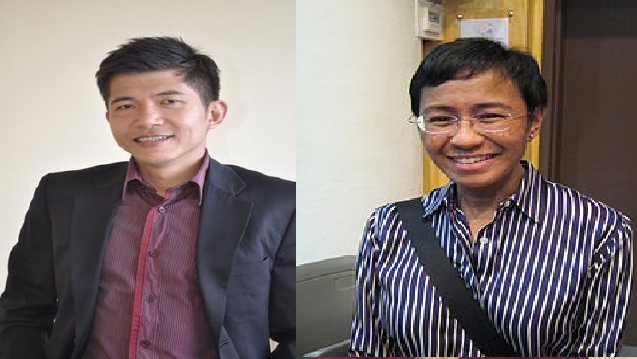 Fakers of news, that is what Ressa and her cohorts in Rappler are."